GLS are a leader within the rental market for power distribution, not just stocking a wide range of combinations to suit every requirement, but now also including the Indu Electric 78way distros complete with the brand new MMPS (Mains Monitoring and Protection System). As the world is moving more and more from dimming heavy shows, to moving light heavy shows, this distro is a Must Have for all your big shows ! Equally, when it comes to dimming, GLS Lighting have a wide variety to cover off every need. 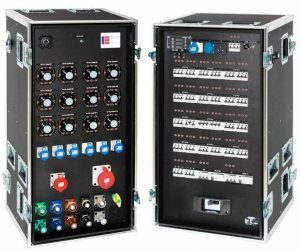 The Avolites ART 2000 T4/T2 dimmer range is undeniably the workhorse of the touring dimmers, but alongside these, we hold smaller configuration racks to offer flexibility for each and every eventuality. The Anytronics 12way +9hot multipurpose rack, for example, includes a DMX splitter, 12 channels of dimming, and 9 hotpower outs all in a very small rack – so is absolutely ideal for conference use.